Kevin Pack Selected as the FIRST EVER Wildlife Artist of the Year for 2013-2014 by the California Rifle Pistol Association. California Rifle and Pistol Association chooses 2013 "Wildlife Artist of the Year"
The California Rifle and Pistol Association is happy to announce the "Wildlife Artist of the Year" for 2013, Mr. Kevin Pack. After a lifetime of hunting, fishing and years spent photographing wildlife, Kevin has a significant understanding of his subjects, which he translates into his artwork. Mr. Pack has worked with multiple groups, including California Ducks Unlimited, Billfish Foundation, and the National Wild Turkey Federation, in his support of their ongoing conservation efforts. Additionally, Kevin's artwork was commissioned by the State of California for their 100th Anniversary Commemorative Hunting License. Kevin Pack has created a unique painting for the CRPA's 1st annual Friends of the CRPA banquet to be held on February 22nd, 2013. Please see below for a depiction of the actual painting. 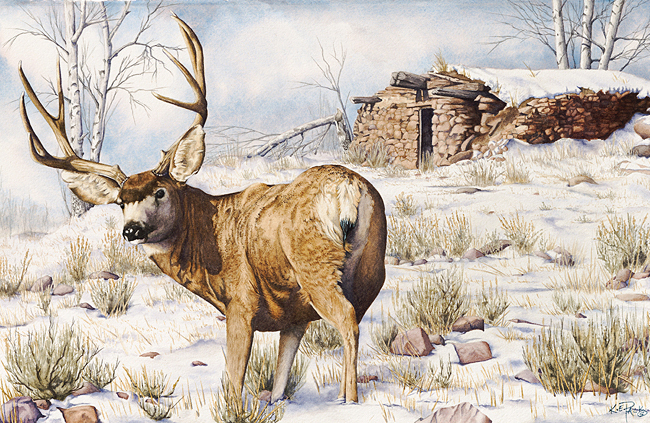 "Hearing Ghosts of the Past" depicts a mule deer just outside of an old rock homestead, where he is overlooking his harem. It is beautifully framed and matted, with a finished size of 23 3/4 inches wide by 31 3/4 inches long, and is ready to hang as soon as you get home, with all of the mounting hardware provided. This one of a kind, original painting will be available only at our banquet. You can read more about Kevin Pack's story at www.kepackwatercolors.com, as well as view his other artwork. Please be sure to visit www.crpa.org today to purchase your tickets for the 1st Annual Friends of the CRPA banquet. We look forward to seeing you there, and appreciate your support of the CRPA and our ongoing efforts in the preservation of your 2nd Amendment rights in the State of California. In 2007, Kevin was selected by the California Department of Fish and Game to produce the 100th annual (and last) California state hunting license. Click here to view license and read the full press release.